Add metadata to images using Exiftool with YAD. 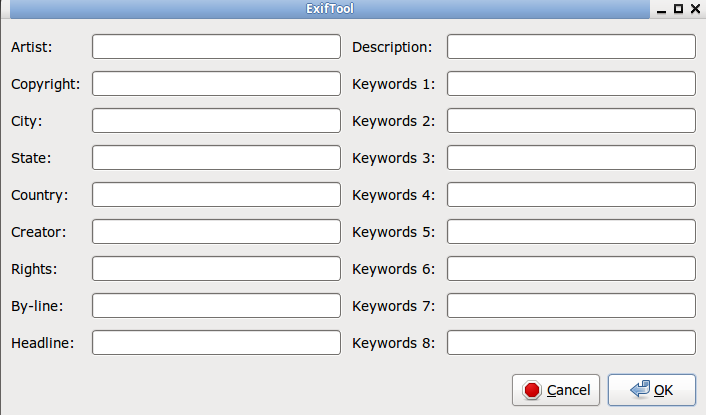 There are 18 fields, 9 fields for entering keywords. All keyword fields must be populated, otherwise no keywords will be applied to the image(s). I haven’t figured out how to solve that issue. After applying metadata to images copies will be created in the working directory, appended with _original. Filenames with spaces will not work with this bash script. This bash script is useful with images that will be uploaded to Flickr, as the metadata fields line up with those Flickr uses to populate data. Fields can be populated by default with information. For example, the first 8 fields in the first column (above) will often require the same information for every image to which you add metadata. "John Doe" "(c) 2015 John Doe" "Chicago" "Illinois" "United States" "John Doe" "(c) 2015 John Doe" "John Doe"
If you don’t want those fields automatically populated with information then delete the above code from the bash script. Change $USER/Scripts/exiftooladdmetadata.sh to the path of the bash script, and change exiftooladdmetadata.sh to the name you give the bash script. Under Appears if selection contains make sure Image Files is checked. I keep my bash scripts in a folder named Scripts in my personal directory. To create the bash script copy the script below and paste it into a text editor. Name the script exiftooladdmetadata.sh and save it to the scripts folder you created. Make the script executable by opening up a terminal and navigating to the folder in which the script is stored. Type chmod +x exiftooladdmetadata.sh and press Enter. The script will now work when used with Thunar Custom Actions. To learn more about Thunar Custom actions click here. See also Exiftool - Strip Metadata from Image.